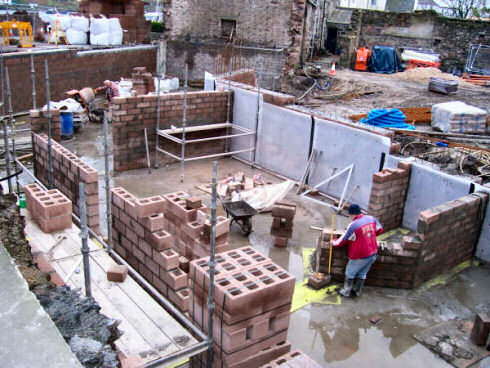 This is how the basement looked on Friday, work on some of the more tricky bits commencing well. Unless the plans have changed the worker in the red top is building the wall between the ‘General Store’ and the ‘Kitchen Store’. On the left (where the scaffolding is standing) will be a corridor. So how do I know that? 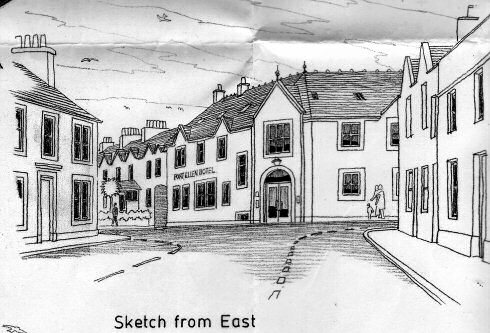 While it says ‘Port Ellen Hotel’ on the drawing I very much doubt this will be the final name for the hotel. That would be too easy and Roland was hinting at something much better. I can't remember the details, but there will be a competition guessing the name on the hotel. Visit Spot the Barrel next week (I believe it will go live then) for the details. The drawings give a good impression of how the hotel will look, I hope to be able to scan further sketches and post them over the next week or so. If you are on Islay you should be able to see the plans in the site office in Port Ellen, but not everyone interested in the hotel has that opportunity. So hopefully more next week. PS: It wasn't meant to be.